CHICAGO (WLS) -- Riot Fest organizers say they've kept their promise to clean up any damage the music festival caused to Humboldt Park, despite an alderman's claims. Red Eye Chicago reports Ald. Robert Maldonado of the 26th Ward no longer wants the music festival to return to Humboldt Park due to the damage the festival caused to the park and what he says was disruption to other park users. Riot Fest has been held in Humboldt Park for the past three years. 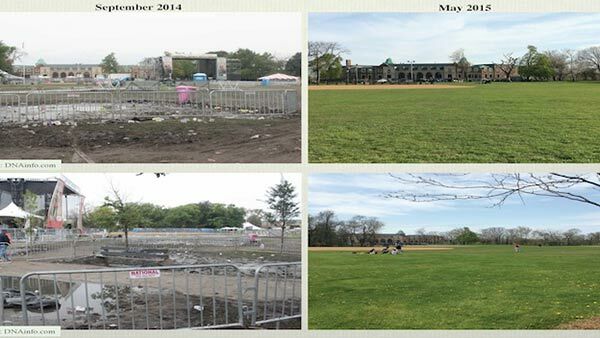 Riot Fest organizers released photos demonstrating the progress they've made in restoring Humboldt Park. Last year, a day of heavy rain turned the festival in to a mud pit. In a statement, organizers said they've had multiple walk-throughs of the park with Chicago Park District supervisors and project managers, who have "continually expressed approval of the progress made thus far." Organizers say neither Maldonado nor any of his staff have attended the walk-throughs. Organizers also say parts of Humboldt Park have infrastructure and drainage problems that predate the music festival, and say they've invested over $150,000 in damage repair and park restoration. They also say they've been preparing plans and dedicating additional resources to lessen the damage for Riot Fest 2015. Those plans include working with city and state officials to clear and maintain the drainage system in and around the grounds, modifying the layout to maximize the open spaces and paved surfaces already in the park, adding time to the production schedule to prepare the park for the event and putting up more protective fencing, more ground cover and more mulch, and having a landscaping contractor onsite before, during and after the event to work with Park Officials to prevent larger problems and repair damage immediately, if possible. "Upon the formation of the Riot Fest Foundation, it has become RFF's job to raise funds to help fix infrastructure issues within the park because of state and city budget cuts," said Riot Fest founder Michael Petryshyn. "The Riot Fest Foundation will certainly take on that project with the main goal of beautifying the park. To me, that's how this relationship becomes stronger." A representative from Ald. Maldonado's office says he stands by his decision not to support Riot Fest's return to Humboldt Park and that he has no further comment. The representative also said no meeting has been called between organizers and the alderman.